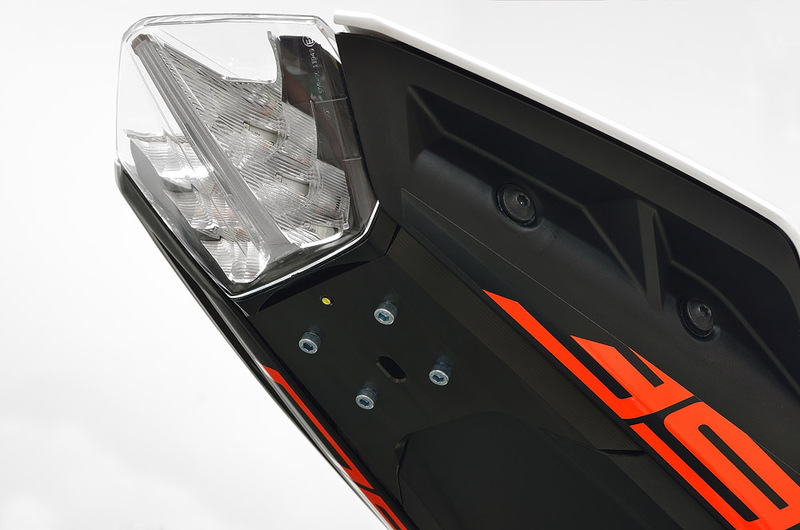 The new MNNTHBX fender eliminator for the KTM 390 Duke is the cleanest, most compact, and function piece in the industry. The quality stainless powder coated mount utilizes factory signals in the tightest position. Remove it in minutes and leave the HDPE base for tidy track day duty. Incorporates our super bright micro plate light. Optional Posi-taps make an easier and clean installation, but aren’t required. Excellent quality fender eliminator for my 2017 Duke 390. It didn’t come with any instructions but it was pretty straightforward to figure out that the passenger seat needed to be removed to get at the turn signal light connectors. I’m super happy with the look, fit and finish! It worked! Everywhere else the fender eliminator for the 17 duke 390 is sold out. This one fit pretty good I only had a problem with 1 out of the 4 bolts that would fall out. Not sure if it’s because of my bike or the kit so I won’t blame it on them. Regardless my bike looks 100 x better than stock. No instructions included but there is a video on YouTube of a guy doing an install video on a 15 or 16 rc390 and it is pretty similar. Only difference is you only have to undo the 4 bolts from the bottom (i think it’s 4 on top and 4 on bottom the the rc) so it’s easier. Shipped pretty quick with no issues. I’m happy with it. Sounds like you must have a stripped bolt hole on your frame if hardware fell out… You should be able to add a nut to the topside if thats the case. We could include instructions, but it’s basically four bolts out, four bolts in. Not much going on there. Enjoy the bike! Great kit, looks super clean. Just 4 bolts from under the tail. Also loosened the left and right side of the fender and the base of the delete slid in and fit like a glove. The posi taps make it quick and clean or cut the factory light wire and solder it to the MNNTHBX light for plug n play to factory. Put it on with a buddy, took about twenty minutes or so. Awesome product and delivery from MNNTHBX! All metal construction and looks great on bike. Easy to install (taking apart the original KTM assembly was the most difficult). This is by far the best I’ve seen for the 2017+ KTM 390 Duke… no need to look further! Nice look and easy to install, only rewiring that I needed to do was for the light that illuminates the license plate, that took 2 minutes, only comment I would suggest using your own electrical connectors I could not get the supplied ones to work, otherwise awesome product, easy to put on and it looks awesome! Super fast shipping and excellent fit and finish on this fender eliminator! It sort of fit, but required quite a lot of trimming and modification to get it to seat correctly in the hollow underneath the bike between the side body panels. Also the tiny white LED that is supposed to illuminate the plate is behind the plate after bolting the plate on, so that is definitely not going to be very functional. Everyone else says theirs was a good fit, maybe I just got a dud or a 2016 mislabeled for 2017? Now that I put in the tedious work of trimming it, it looks good, though plate not being lit is not legal. Due to exchange rate, it was pretty expensive but worth every penny. Fits perfectly and is the best looking one out there. Made out of high quality materials. Looks better than the yoshi. Very happy with this product. Very nice product. Looks great on the bike and fairly easy to install. Took me about 15 minutes from start to finish. Only had to splice in 1 wire for the license plate light. I’d highly recommend this kit. Very fast shipping as well! Great fender eliminator! Easy to install and looks better than stock. First mod I installed on my duke. Was super fast and incredibly simple. Makes the back end look incredible. Fit and finish is top notch. There are no instructions, but it’s pretty straightforward. Looks great. Literally first thing I did to my bike. Worked perfect! Had to loosen the sides to get it locked in but who doesn’t like a tight fit 😉 looks and performs as it should. Thank you! so just to make sure this will fit a 2018 390 duke? Perfectly Engineered. Very easy to install. You will not be disappointed with this piece. Great Product! The fit and finish is perfect on my 2018 Duke. Installation was easy. A quick reference on YouTube and off I went. It looks great!